Did you know that a fifth of UK school children drink no water and 10% of schools lack drinking water facilities? The importance of having easily accessible drinking water fountains at schools has been a rising factor. There are various reasons as to why this is a growing problem. Luckily, there is a solution which needs to be implemented. Over time, if implemented correctly, this issue of water accessibility can be solved. At Drinking Water Fountains, we are aware of this situation and have been working for many years to establish a range of drinking water fountains, under sink chillers and coolers. This process has been carefully processed to ensure that the needs of the education sector are met. Our aim is to assist the education sector by providing students with easy access to clean drinking water. Children’s nutrition is just as important and schools have the ability to assist in that. 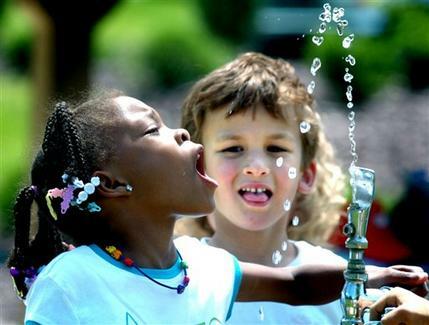 We have a variety of outdoor drinking water fountains which will be perfect for schools. Children will be able to easily access water from our drinking water fountains. Our water fountains are regularly serviced to guarantee the prolonged integrity of the water fountains. We also offer a wide range of drinking water bottles which can also be branded for the school. We encourage the education sector to think about implementing more drinking water fountains in schools. If you are interested in our drinking water fountains or any other products or services, please do not hesitate to contact us on 0845 500 4455. Alternatively, you can fill in our contact form here with your queries and we will call you back. Looking forward to hearing from you.